Received November 8, 2018; Accepted January 1, 2019.; Published online January 24, 2019. Ultraviolet (UV) radiation of the sunlight, especially UVA and UVB, is the primary environmental cause of skin damage, including topical inflammation, premature skin aging, and skin cancer. Previous reports show that activation of nuclear factor-κB (NF-κB) in human skin fibroblasts and keratinocytes after UV exposure induces the expression and release of proinflammatory cytokines, such as interleukin-1 (IL-1) and tumor necrosis factor-α (TNF-α), and subsequently leads to the production of matrix metalloproteases (MMPs) and growth factor basic fibroblast growth factor (bFGF). Here, we demonstrated that TNFR2-SKEE and TNFR2-SKE, oligopeptides from TNF receptor-associated factor 2 (TRAF2)-binding site of TNF receptor 2 (TNFR2), strongly inhibited the interaction of TNFR1 as well as TNFR2 with TRAF2. In particular, TNFR2-SKE suppressed UVB- or TNF-α-induced nuclear translocalization of activated NF-κB in mouse fibroblasts. It decreased the expression of bFGF, MMPs, and COX2, which were upregulated by TNF-α, and increased procollagen production, which was reduced by TNF-α. Furthermore, TNFR2-SKE inhibited the UVB-induced proliferation of keratinocytes and melanocytes in the mouse skin and the infiltration of immune cells into inflamed tissues. These results suggest that TNFR2-SKE may possess the clinical potency to alleviate UV-induced photoaging in human skin. Continuous exposure of the skin to ultraviolet (UV) radiation causes topical skin damages and leads to inflammatory responses, resulting in premature skin aging, defined as “photoaging”, which is characterized by wrinkling, laxity, dryness, roughness, and pigmentation (Chiu et al., 2017; Pandel et al., 2013). Previous studies showed that unlike chronological aging, which is an intrinsic process, photoaging of the skin is an extrinsic process attributable to the damage of the skin cells’ DNA by reactive oxygen species (ROS) such as superoxide and hydrogen peroxide, prolonged inflammation due to the production of inflammatory cytokines such as IL-1, IL-6, and TNF-α from keratinocytes and fibroblasts, and the constant degradation of structural proteins such as collagen, gelatin, and elastin by high levels of secreted matrix metalloproteases (MMPs) (Bosch et al., 2015; Fagot et al., 2002; Fisher, 2005; Pandel et al., 2013). Thus, UV radiation is a harmful environmental factor affecting the internal structure and composition of the skin. Studies show that repetitive irradiation with UVB activates the transcription factor AP-1 and NF-κB and thereby markedly upregulates the expression and release of proinflammatory cytokines in human epidermal keratinocytes and dermal fibroblasts (Bashir et al., 2009a; 2009b; Saliou et al., 1999; Simon et al., 1994; Skov et al., 1998). However, the molecular mechanism underlying the upregulation of TNF-α at the UV-irradiated regions still remains to be elucidated. TNF-α is associated with several inflammatory responses in the skin. The secreted TNF-α stimulates endothelial cells to recruit circulating immune cells, which secrete MMPs, and subsequently induces degradation of collagen fibers, resulting in localized skin damage (Bashir et al., 2009b; Grine et al., 2015; Rijken et al., 2006). TNF-α stimulates the signal transduction pathway involved in NF-κB activation, leading to a vicious cycle that amplifies NF-κB activity (O’Dea et al., 2008; Tanaka et al., 2005; 2010). NF-κB activation induced by TNF-α is obviously required for MMP-9 expression in human dermal fibroblasts and pro-MMP-2 activation via induction of MT1-MMP in human skin (Bond et al., 1998; Han et al., 2001; Zhou et al., 2009). In addition, over-expression of MMP-1 and MMP-13 was observed following NF-κB activation in fibroblast-like synoviocytes (Sun et al., 2002). NF-κB activation is also required for the upregulation of MMP-1 and MMP-3 in fibroblasts (Tanaka et al., 2005). Therefore, skin photoaging may be prevented by suppressing MMP expression via inactivation of NF-κB. Epidermally-released TNF-α binds to its specific receptor TNFR1, which is predominantly expressed in the skin tissue. Subsequently, it recruits TRADD, followed by receptor-interacting protein 1 (RIP1) and TRAF2 proteins, key mediators in TNFR1-mediated signaling (Zhang et al., 2007). TRAF2 is a ubiquitously expressed member of the TRAF family of cytoplasmic adapter and scaffolding proteins that can undergo homo- or hetero-oligomerization with other TRAF members, TRAF1, TRAF5, and TRAF6 (Davies et al., 2005; Declercq et al., 1998; Kim et al., 2018; Rothe et al., 1996). TRAF2 directly binds to the cytoplasmic domain of CD27, CD30, CD40, and TNFR2 via a C-terminal part of its TRAF domain (Faustman and Davis, 2010; Hijdra et al., 2012; Rothe et al., 1996). Previous studies showed that TRAF2 also engages in TNFR1 signaling by binding to TRADD via its C-terminal TRAF domain and activates downstream IKK/NF-κB and MAPK signaling pathways that contributes to multiple inflammatory responses (Varfolomeev and Ashkenazi, 2004; Zhang et al., 2007). The specific motif SKEE in a C-terminal domain of TNFR2 acts as a binding site for TRAF1/TRAF2 (Declercq et al., 1998; Ye et al., 1999). Therefore, we reasoned that TNFR2-derived peptides which specifically bind to a conserved C-terminal TRAF domain of TRAF2 can function as competitive inhibitors of TNFR1- as well as TNFR2-mediated signaling pathways. We herein determined the effects of TNFR2-SKE, a representative TNFR2-derived tripeptide, on the interaction of TRAF2 with TNFR1 or TNFR2, TNFR1-mediated signaling pathway, and UVB-induced skin aging. Our results show that TNFR2-SKE may function as a powerful antagonist for UV-induced TNFR1 signaling by blocking the interaction of TRAF2 with TNFR1 and thereby protecting the skin from UV-induced damage. HaCaT human keratinocyte and NIH3T3 mouse fibroblast were obtained from the American Type Culture Collection (ATCC) and cultured in complete Dulbecco’s modified Eagle’s medium (DMEM) containing 10% (v/v) fetal bovine serum (FBS), 100 unit/ml penicillin, and 100 μg/ml streptomycin (all from Gibco-BRL, USA). Human monocytic cell lines, U937 and THP-1, were obtained from ATCC and cultured in complete Roswell Park Memorial Institute (RPMI) 1640 (10% FBS, 100 unit/ml penicillin, and 100 μg/ml streptomycin). HDFa (human dermal fibroblast, adult) was purchased from the Life Technologies and cultured in medium106 supplemented with low serum growth supplement kit (LSGS) (ThermoFisher Scientific, USA). All cells were maintained at 37°C in a humidified 5% CO2 incubator. Based on the amino acid sequences in the TRAF2-binding site of TNFR2, TNFR antagonistic peptides and amino acid substitution variant were synthesized using an automatic peptide synthesizer (PeptrEX-R48, Peptron, Korea) according to the manufacturer’s recommended protocol. Purification and analysis of the synthesized polypeptides were performed using reverse-phase high-performance liquid chromatography (Prominence LC-20AB, Japan) and mass spectrometry (HP1100 Series LC/MSD, Hewlett-Packard, USA). Cells were seeded in 6-well plates at a concentration of 3 × 105 cells per well in complete DMEM. The following day, the cells were serum-starved for 6 h in DMEM with 0.1% bovine serum albumin (BSA). The cells were irradiated with UVB (312 nm wavelength, 15 mJ/cm2) after rinsing with 1× phosphate-buffered saline (PBS). UVB irradiation was measured using a VLX-3W research radiometer (VILBER, France). After UVB irradiation, the cells were treated with each of the following reagents. Interactions between two molecules were determined using in situ PLA (Duolink® In Situ reagents, O-LINK® Bioscience, Sweden) as described previously (Lee et al., 2016). Briefly, cells were plated onto round coverslips in 24-well cell culture plates and grown for 24 h in complete DMEM. The cells were serum-starved for 6 h in DMEM with 0.1% BSA, then pretreated with each reagent as indicated (TNFR2-SKE for 0.5 h, dexamethasone (DEX; Sigma, USA) for 3 h, or dehydroascorbic acid (DHA; Sigma, USA) for 1 h at 37°C in a 5% CO2 incubator). The cells were additionally stimulated with TNF-α (25 or 50 ng/ml), followed by washing twice with 1× PBS. Cells were fixed with 2% formaldehyde in PBS for 15 min at room temperature. All procedures for in situ PLA were performed according to the manufacturer’s recommended protocol and protein-protein interactions were analyzed using a confocal laser-scanning microscope (Olympus FluoView FV1000, Olympus, Japan). We used antibodies against the following target proteins: TNFR1, TRAF2, NF-κB/p50 (Santa Cruz Biotechnology), and NF-κB/p65 (Cell Signaling Technology). Cells were seeded in 35-mm dishes (5 × 105 cells per dish). The next day, the cells were serum-starved for 6 h in DMEM with 0.1% BSA and pretreated with TNFR2-SKE, DHA, or TNF-α inhibitors as indicated (TNFR2-SKE and TNF-α inhibitor (Merck, Germany) for 0.5 h or with DHA for 1 h at 37°C in a 5% CO2 incubator), followed by additional treatment with TNF-α. The cells were lysed with 1% NP40 lysis buffer (1% Nonidet P40, 150 mM NaCl, 50 mM Tris-HCl (pH 8.0), and 5 mM EDTA) containing 1 mM sodium orthovanadate and protease inhibitor cocktail. Total cell lysates were subjected to sodium dodecyl sulfate-polyacrylamide gel electrophoresis (SDS-PAGE) and the separated proteins were transferred to a polyvinylidene fluoride (PVDF) membrane. The PVDF membrane was subsequently incubated for 1 h at room temperature in blocking solution (3% bovine serum albumin in TBS containing 0.05% Tween 20). The target proteins were probed with antibodies against TNFR1, TRAF2, bFGF, MMP-1, COX-2, β-actin (Santa Cruz Biotechnology), TNFR2 (Invitrogen), MMP-9 (Merch Millipore), and IkB (Cell Signaling Technology). All antibodies were diluted 1:1000 in TBS buffer containing 0.05% Tween 20 and 0.5% BSA, and the membrane was incubated overnight at 4°C. The membrane was washed with TBS-T (0.05% Tween 20) buffer and incubated with an appropriate secondary antibody (horse radish peroxidase-conjugated anti-IgG). After washing the membrane, proteins were detected using West-Zol plus kit (iNtRON Biotechnology, Inc., Korea). NIH3T3 cells were pretreated with TNFR2-SKE 30 min before stimulating with mouse TNF-α as described above. In one set of experiments, the cells were irradiated with UVB 4 h before incubating with TNFR2-SKE. The cells were lysed with 150 μl of ice-cold cytoplasmic extract (CE) buffer [0.3% Nonidet P40, 10 mM KCl, 10 mM HEPES (pH 7.9), and 0.1 mM EDTA] containing 1 mM sodium orthovanadate and a protease inhibitor cocktail. The cell lysates were centrifuged for 5 min at 3,000 r.p.m. The supernatants were collected and used for cytoplasmic protein analysis. The nuclear pellets were washed twice with ice-cold CE buffer, then resuspended in 40 μl of ice-cold nuclear extract (NE) buffer [400 mM NaCl, 20 mM HEPES (pH 7.9), 25% glycerol, and 1 mM EDTA] containing 1 mM sodium orthovanadate and a protease inhibitor cocktail. Samples were centrifuged for 5 min at 14,000 r.p.m. ; the supernatants collected were used for nuclear protein analysis. Cytoplasmic and nuclear fractions were subjected to SDS-PAGE followed by western blotting. The target proteins were probed with an NFkB p65 subunit antibody (Cell Signaling Technology). Pol II (Santa Cruz Biotechnology) and β-tubulin (Cell Signaling Technology) were used as loading controls for nuclear and cytoplasmic extracts, respectively. Chromosome immunoprecipitation (ChIP) assay was performed to analyze the binding of NF-κB to the promoter of human MMP-9. Cells were pretreated with TNFR2-SKE or DHA as described above, followed by TNF-α treatment. In one set of experiments, the cells were irradiated with UVB 4 h before incubating with DEX, DHA, or TNFR2-SKE. Fresh formaldehyde (3.7%) was added to the cells (1 × 107 cells per precipitation) at a final concentration of 1%. Cells were incubated on a shaking platform for 10 min at room temperature, and crosslinking was quenched by adding of 1.375 M glycine to a final concentration of 0.125 M. After washing twice with 1× PBS, the cells were harvested in cell lysis buffer containing 1× protease inhibitor cocktail. Nuclei were pelleted by centrifugation at 2,500 × g for 5 min at 4°C. The nuclei were resuspended in nuclear lysis buffer plus 1× protease inhibitor cocktail and sonicated with the ultrasonic probe while keeping samples on ice to shear the crosslinked DNA to an average length of 200–1000 bp, following which the samples were centrifuged. Thirty microliters of each treatment were stored as total input control. The soluble chromatin was precleared by incubating with sheared salmon sperm DNA-BSA-protein A agarose slurry on a rotating platform for 15 min at 4°C. The precleared chromatin solution was diluted 3-fold using dilution buffer with 1× protease inhibitor cocktail, and then incubated with protein A/G agarose (Santa Cruz Biotechnology) and antibodies specific for NF-κB/p65 or nonspecific rabbit immunoglobulin G (rabbit IgG) on a rotating platform overnight at 4°C. The immunoprecipitated complex-agarose beads were pelleted by centrifugation 14,000 rpm for 5 min at 4°C and washed with 1× dialysis buffer (2 mM EDTA, 50 mM Tris-Cl, pH 8.0, 0.2% Sarkosyl) containing 1× protease inhibitor cocktail and then eluted with elution buffer (1% SDS, 50 mM NaHCO3). To reverse the crosslinking, 4 μl of 5 M NaCl was added to each sample and the samples were incubated at 67°C for 4 h or boiled for 15 min. One microliter of 10 mg/ml RNase A was added to each sample, followed by incubation at 37°C for 30 min. The precipitated DNA was purified via phenol-chloroform extraction. PCR amplification was performed with primer pair 5′-TGTCCCTTTACTGCCCTGA-3′ (forward) and 5′-ACTCCAGG CTCTGTCCTCCTCTT-3′ (reverse), which were specifically designed on the MMP-9 promoter region (−657 to −484) (Bera et al., 2013). The PCR products were analyzed using agarose gel electrophoresis and visualized using ethidium bromide (EtBr). Six-week-old male DBA/2 mice were obtained from Dooyeol Biotech (Seoul, Korea). All mice were randomly assigned to three groups of five animals each (UVB irradiation + TNFR2-SKE treatment, UVB-alone treatment, and no treatment). For the groups of UVB + TNFR2-SKE and UVB-alone treatments, the heads of mice were locally exposed to UVB at a dose of 180 mJ/cm2 (312 nm) of UVB irradiation using a VLX-3W research radiometer every other day for 12 days. For the TNFR2-SKE treatment group, 10 mg/kg of TNFR2-SKE was administered intraperitoneally (i.p.) every day during the period of UVB irradiation. The same volume of saline was injected i.p. to UVB-alone and no treatment groups. The ears were excised from all subjects after 12 days. Ear specimens of each animal was paraffin-embedded for the immunohistochemical determination of skin thickness using hematoxylin and eosin (H & E) staining. Neutrophil accumulation was analyzed after staining with antibody against the neutrophil marker, NIMP-R14 (Santa Cruz Biotechnology). Another ear sample was stored at -80°C for staining melanocytes. For quantitative measurement of a number of melanocytes, cells were stained with L-3,4-dihydroxyphenylalanine (L-DOPA) solution. For visualization of melanocytes existing in the dorsal skin of mice, the skin tissues were immersed in 2 M sodium bromide (NaBr; Sigma, USA) solution at 37°C for 2 h and the epidermis was removed from the dermis. Melanocytes in the epidermal layer were stained by immersing in 0.1 M PBS (pH 7.2) containing 0.14% L-DOPA (Sigma, USA) at room temperature for 3 h, and the stained cells were observed using a microscope (Olympus BX51, Olympus). The thickness of the epidermis, and the number of melanocytes and neutrophils were measured using the NIS-element software. Data are expressed as the average of the mean values obtained ± the standard deviation (SD). Statistical significance was determined using the Student’s t-test with the statistical software Prism (version 4.0; GraphPad, San Diego, CA), and P < 0.05 was considered statistically significant. All experiments were conducted twice or more to obtain reproducible results. Representative data are shown in the figures. Based on the homologous amino acid sequences of the functional C-terminal TRAF2-binding site of TNFR2, we prepared synthetic oligopeptides derived from amino acid residues 424 through 427 and the amino acid substitution variant peptide (Fig. 1A). To investigate the antagonistic effect of the synthetic peptides on TNF-α-induced activation of TNFR2 signaling, we performed in situ PLA and analyzed the physical proximity between TNFR2 and TRAF2 in human monocytic cell line U937. TNFR2-SKEE and TNFR2-SKE significantly inhibited TNF-α-induced interaction of TNFR2 with TRAF2, which was comparable to the efficiency of the TNF-α specific inhibitor (Fig. 1B). In contrast, TNFR2var1-IKE, in which the serine residue was substituted by isoleucine, did not affect the TNFR2-TRAF2 interaction. In particular, TNFR2-SKE, a representative trimeric peptide, dose-dependently inhibited the TNF-α-induced interaction of TNFR2 with TRAF2 (Fig. 1C). Next, we confirmed the expression levels of TNFR1, TNFR2, and TRAF2 in monocytes (U937 and THP-1), keratinocyte (HaCaT), and fibroblasts (human dermal fibroblast, and NIH3T3). TNFR1 and TRAF2 were abundantly expressed in all five cell lines, whereas TNFR2 was expressed in only human monocytic cells (Fig. 1D). Expression of these receptors and adaptor proteins was not affected by treatment with TNF-α and TNFR2-SKE. These results suggest that this synthetic peptide acts as an effective competitive antagonist for the binding of TRAF2 to TNFR2. To test our hypothesis that the TNFR2-derived peptide TNFR2-SKE can inhibit the interaction of TRAF2 with TNFR1 and TNFR2 by binding to a conserved C-terminal TRAF domain of TRAF2, we examined whether TNFR2-SKE can affect TNFR1-mediated signaling in mouse fibroblasts induced by TNF-α treatment. Interestingly, TNFR2-SKE interfered with the TNF-α-induced interaction between TNFR1 and TRAF2 in a dose-dependent manner (Fig. 2A). 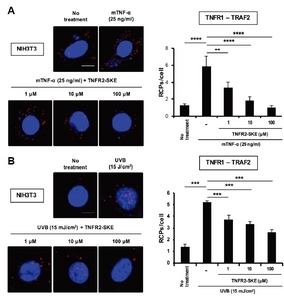 In addition, TNFR2-SKE significantly inhibited the UVB-induced interaction of TRAF2 with TNFR1 (Fig. 2B). These results suggest that this synthetic peptide derived from TNFR2 acts as an efficient inhibitor of TNFR1-mediated signaling. Next, we investigated the effect of TNFR2-SKE on the IKK/NF-κB signaling pathway using western blotting and in situ PLA assay in TNF-α-stimulated mouse fibroblasts. TNFR2-SKE treatment dose-dependently prevented IκB degradation induced by TNF-α, but not IL-1β (Fig. 3A). The TNF-α inhibitor conferred protection only against TNF-α-mediated degradation of IκB, whereas DHA provided protection against IκB degradation in response to both cytokines. In addition, TNFR2-SKE exerted a powerful inhibitory effect on NF-κB translocalization from the cytoplasm to the nucleus, which was promoted by TNF-α (Fig. 3C). UVB-induced reactive oxygen intermediates activate NF-κB to produce proinflammatory cytokines, resulting in activation and amplification of the IKK/NF-κB signaling pathway (Simon et al., 1994; Xia et al., 2005). We performed in situ PLA to determine whether TNFR2-SKE suppresses UVB-induced NF-κB activation. Consistent with previous results, TNFR2-SKE also suppressed the nuclear translocalization of NF-κB in a dose-dependent manner (Fig. 3D). Dexamethasone was used as a well-known anti-inflammatory agent. Furthermore, the inhibitory effect of TNFR2-SKE on TNF-α- or UVB-induced localization of NF-κB p65 subunit was supported by cytosol/nuclear fractionation experiment (Fig. 3B). Taken together, these results indicate that TNFR2-SKE specifically inhibited TNF-α-induced TNFR1-mediated signaling and subsequent activation of IKK/NF-κB signaling pathway in mouse fibroblasts. NF-κB plays an important role in transcriptional regulation of various genes that are involved in cell growth, survival, proliferation, apoptosis, adhesion, migration, carcinogenesis, and inflammation (Escarcega et al., 2007; Abdel-Rahman et al., 2015). TNF-α-induced activation of NF-κB in fibroblasts and keratinocytes is essential for enhancing the expression of downstream target genes via binding to promoter regions. The results of ChIP analysis showed that TNF-α and UVB radiation induced the binding of NF-κB to the MMP-9 promoter (Fig. 4A). In contrast, the level of promoter-bound NF-κB was reduced by treatment with TNFR2-SKE. In agreement with this, TNFR2-SKE treatment downregulated TNF-α-induced MMP-1 and -9 expressions in a dose-dependent manner (Fig. 4B). In addition to the inhibition of MMP expression, TNFR2-SKE suppressed the expressions of bFGF and COX2, which were promoted by TNF-α treatment (Fig. 4C). In contrast, TNFR2-SKE restored procollagen expression, which was reduced by TNF-α treatment, suggesting that TNFR2-SKE can prevent cutaneous alterations via downregulation of inflammation mediators and upregulation of major structural proteins. Previous studies showed that UVB irradiation induces the expression of bFGF, followed by hyperproliferation of keratinocytes and fibroblasts (Berking et al., 2001; Bielenberg et al., 1998; Hirobe et al., 2002; Tanaka et al., 2005). As our antagonistic peptide inhibited TNF-α-induced bFGF production by human keratinocytes (Fig. 4C), we assessed the effects of TNFR2-SKE on epidermal hyperplasia in the skin of UVB-irradiated mice. Figure 5A shows that compared to normal skin, UVB increased the thickness of epidermis by 6.2-fold. In contrast, treatment with TNFR2-SKE markedly decreased the epidermal thickness by 2.0-fold. After UVB radiation, the infiltration of neutrophils into the dermis increased by approximately 10-fold compared to the control untreated skin, whereas it was suppressed by TNFR2-SKE treatment to 3-fold (Fig. 5B). Finally, we determined the effects of TNFR2-SKE on melanocyte proliferation using immunohistochemical L-DOPA staining. UVB increased melanocyte proliferation by 6.7-fold compared to the control untreated skin (Fig. 5C). Treatment with TNFR2-SKE significantly reduced melanocyte proliferation to 2.4-fold compared to the control. 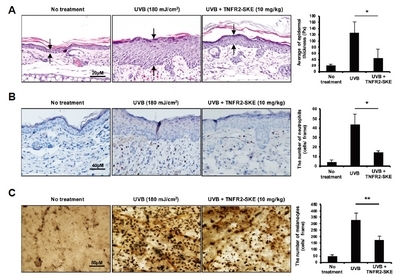 These results suggest that TNFR2-SKE may ameliorate the UVB-mediated skin damage via regulation of keratinocyte and melanocyte proliferation and inflammatory responses. In this study, we showed that TNFR2-SKE strongly inhibited the interaction of TNFR1 as well as TNFR2 with TRAF2. TNFR2-SKE suppressed UVB or TNF-α-induced nuclear translocalization of activated NF-κB in mouse fibroblasts. It suppressed the TNF-α-induced upregulation of bFGF, MMPs, and COX2 expression, whereas it increased procollagen production, which was reduced by TNF-α. Furthermore, it inhibited the UVB-induced proliferation of keratinocytes and melanocytes in mouse skin and the infiltration of immune cells into inflamed tissues. Collectively, these results suggest that TNFR2-SKE may be clinically potent at alleviating photoaging in UV-radiated human skin. TRAF2 appears to be the target molecule for blocking TNFR-mediated signaling as TRAF2 acts as a common signal transducer for TNFR1, TNFR2, CD30, and CD40, involved in the activation of NF-κB and various intracellular kinases (Bradley and Pober, 2001; Chung et al., 2002). TRAF2 directly binds to various cell surface receptors, including those of the TNFR family and cytoplasmic adapters via a highly conserved carboxyl-terminal domain, named the TRAF domain (Rothe et al., 1996; Henkler et al., 2003). It is well-known that the 37 amino acids in the C-terminal homology domain of TNFR2 contribute to binding to TRAF1/TRAF2. Several different TRAF2-binding consensus sequences were identified, namely, the ϕSxEE (ϕ = large hydrophobe, x = any amino acid) sequence in TNFR2 and CD30, the PxQx(T/S/D) motif in LMP1, CD27, CD30, and CD40, and the QEE motif in 4-1BB and Ox40 (Boucher et al., 1997; Declercq et al., 1998; Rothe et al., 1994; Ye et al., 1999). In contrast, TRAF2 indirectly binds to TNFR1 via the TRADD adaptor protein. TNFR1 and TRADD possess the SXXE/D motifs in their death domain necessary for the formation of stable TNFR1 and TRADD complex and subsequent activation of the IKK/NF-κB pathway (Guan et al., 2011). In addition, TRAF2 also binds to TRADD via its C-terminal TRAF domain, similar to its binding to TNFR2. Therefore, we hypothesized that TRAF2 regulates TNFR1- as well as TNFR2-mediated signaling via the same C-terminal region of its own TRAF domain. This suggests that TNFR2-SKE acts as a competitive inhibitor of TNFR signaling pathways by blocking the common interacting site of TRAF2. The trimeric peptide was derived from amino acid residues 424 through 426 in a highly conserved TRAF2-binding region of TNFR2. Additionally, the amino acid substitution variant peptide was prepared as a negative control by substituting isoleucine for serine at position 424, since the consensus sequence (P/S/A/T)x(Q/E)E has been identified as the major TRAF-binding motif. Remarkably, TNFR2-SKE efficiently inhibited TNF-α-induced interaction of TRAF2 with TNFR1 as well as TNFR2, whereas the variant peptide did not affect the TNFR2-TRAF2 interaction, suggesting that the trimeric peptide effectively prevented the binding of TRAF2 to TNF receptors and that serine 424 may be an important residue in the interaction of TRAF2 with TNFR2. This antagonistic tripeptide also inhibited the TNF-α- or UVB-induced activation of IKK/NF-κB signaling by blocking degradation of IκB and the binding of NF-κB to the promoter of the target gene, which reduced the expression of MMPs, bFGF, and even COX2. In contrast, collagen production recovered completely to the level of the control. The TNF receptor is one of the main transmembrane proteins, which is activated by exposure to UVB radiation. TNF-α-induced TNFR1 activation induces the recruitment of TNFR-associated death-domain protein (TRADD), which functions as an adapter molecule, and subsequently recruits receptor-interacting protein-1 (RIP1) and TRAF2 to form a multiprotein complex that directly activates the downstream IKK/NF-κB signaling. Several previous studies have shown that NF-κB plays critical roles in TNF-α-induced inflammatory diseases, suggesting that NF-κB may act as the direct target of anti-inflammatory drugs. Therefore, blocking TNFR1 signal transduction using specific antagonists may be a promising strategy for overcoming TNF-α-mediated skin photoaging, which is induced by UVB irradiation. 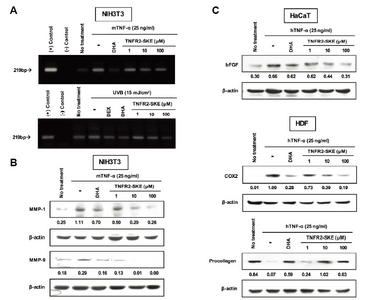 Recent studies have shown that TNFR1 is ubiquitously expressed in almost all cell types, whereas the expression of TNFR2 is much more limited in specific cell types including specific neuronal cells in the brain, certain T-cell subpopulations, endothelial cells, cardiac myocytes, thymocytes, and mesenchymal stem cells (Borghi et al., 2016; Naude et al., 2011; Zhang et al., 2007). Especially, TNFR1 acts as a major mediator of TNF-α-induced signaling pathway and plays a critical role in the UVB-induced photoaging process in skin. In our in vitro experiments, it is shown that TNFR2-SKEE and TNFR2-SKE have an equal inhibitory effect on the TRAF2-binding to the cytoplasmic motif of TNFR2. Because skin absorption efficiency of a peptide is a critical factor for in vivo activity, we chose the smaller trimeric peptide TNFR2-SKE with a molecular weight less than 500 Daltons, which could allow efficient penetration through the skin (Bos and Meinardi, 2000). Surprisingly, TNFR2-SKE effectively restored the typical characteristics of UVB-damaged skin to normal conditions. In addition, the peptide sufficiently inhibited infiltration of immune cells into the inflamed skin tissue. These results suggest that TNFR2-SKE can efficiently penetrate skin layers and cell membranes and that TNFR2-SKE-mediated inactivation of TNFR1 signaling elicits anti-aging benefits in photoaged skin. In conclusion, this study demonstrates that TNFR2-SKE can suppress TNF-α-induced activation of the IKK/NF-κB signaling pathway and subsequent inflammatory responses by interfering with the direct binding of TRAF2 to TNFR1, suggesting that it may function as a novel anti-photoaging agent for maintaining skin health. Fig. 1. (A) Scheme of development of novel TNFR2 synthetic peptides. S, signal sequence; PLBS, polypeptide ligand binding site; HI, homodimer interface. (B and C) U937 cells were incubated for 30 min with various TNFR2-peptides (TNFR2-SKEE and TNFR2-SKE) and variant (TNFR2var1-IKE) or various concentrations of TNFR2-SKE, followed by treatment with 50 ng/ml human TNF-α for 10 min in the presence or absence of each peptide. The interaction between TNFR2 and TRAF2 was analyzed using in situ PLA. The graph indicated the intensity of interaction between molecules mentioned above. PLA signals in the cell population (n = 5) were quantified using the NIS Elements analysis. The average number of rolling-circle products (RCPs) per cell ± SD is shown. ***p < 0.001. Nuclei were stained with DAPI (blue fluorescence). Magnification, ×600; scale bars = 10 μm. (D) Three different cells (NIH3T3 mouse fibroblasts, HaCaT human keratinocytes, and human dermal fibroblasts) were seeded in 35-mm dishes and two different monocytic cells (U937 and THP-1) were maintained in culture dishes. After serum starvation for 6 h, the cells were treated with TNFR2-SKE (100 μM), human TNF-α (25 or 50 ng/ml), or mouse TNF-α (25 ng/ml) for 15 min as described in Materials and Methods. Whole cell lysates were subjected to SDS-PAGE and analyzed using western blotting with the indicated antibodies. Band intensity was quantified using ImageJ software. Fig. 2. (A) NIH3T3 cells were incubated for 30 min with various concentrations of TNFR2-SKE, and then treated with 25 ng/ml mouse TNF-α for 10 min in the presence of TNFR2-SKE. (B) Cells were irradiated with UVB (312 nm wavelength, 15 mJ/cm2), followed by treatment with TNFR2-SKE for 4 h. The interaction between TNFR1 and TRAF2 was analyzed using in situ PLA. The graph indicated the intensity of interaction between molecules mentioned above. PLA signals in the cell population (n = 5) were quantified using NIS Elements analysis. The average number of rolling-circle products (RCPs) per cell ± SD is shown. **p < 0.01, ****p < 0.0001. Nuclei were stained with DAPI (blue fluorescence). Magnification, ×600; scale bars = 10 μm. Fig. 3. (A) NIH3T3 cells were seeded in 35-mm dishes. After serum starvation for 6 h, the cells were treated with 25 ng/ml human or mouse TNF-α and IL-1β, or 100 μM of TNFR2-SKE for 15 min as described in the Materials and Methods. DHA (1 mM) and TNF-α inhibitor (5 μM) were used as positive controls. Cell lysates were subjected to SDS-PAGE and IκB degradation was analyzed using western blotting. (B) Cell extracts were fractionated into nuclear and cytoplasmic fractions. Each fraction was analyzed for the localization of NF-κB/p65 using western blotting. Purity of each fraction was proven by co-analyzing β-tubulin (cytoplasmic) and RNA polymerase II (nuclear). Band intensity was quantified using ImageJ software. (C) Cells were pretreated with 1 mM of DHA for 1 h or with TNFR2-SKE for 0.5 h dose-dependently, and then treated with 25 ng/ml mouse TNF-α for additional 1 h. (D) Cells were irradiated with UVB (312 nm wavelength, 15 mJ/cm2), followed by treatment with TNFR2-SKE or DEX (10 μM) for 4 h. (C and D) In situ PLA was performed to analyze the interaction between NF-κB/p65 and NF-κB/p50. PLA signals in the cell population (n = 5) were quantified using the NIS Elements analysis. The average number of rolling-circle products (RCPs) per cell ± SD is shown. ***p < 0.001. Fig. 4. (A) In one set of experiments, NIH3T3 cells were pretreated with TNFR2-SKE or DHA as described in Materials and Methods, followed by treatment with 25 ng/ml mouse TNF-α for 1 h. In another set of experiments, cells were treated with 10 μM of DEX, 1 mM of DHA, or various concentrations of TNFR2-SKE for 4 h after UVB irradiation (312 nm wavelength, 15 mJ/cm2). ChIP assay was performed using anti-NF-κB/p65 antibody to confirm NF-κB binding on the promoter region (−657 to −484) of MMP-9. (B and C) Each cell type was treated with 1 mM of DHA or various concentrations of TNFR2-SKE, and then additionally with 25 ng/ml of human or mouse TNF-α for 24 h. The cell lysates were subjected to SDS-PAGE, and then analyzed using western blotting with the antibodies indicated. Band intensity was quantified using ImageJ software. Fig. 5. The TNFR1 antagonist TNFR2-SKE (10 mg/kg) or same volume of phosphate buffered saline (PBS control) was administered to DBA/2 mice (n = 5 for each group) by i.p. injections for every 12 days. Mice in the UVB + TNFR2-SKE and UVB alone groups were exposed to UVB irradiation at 180 mJ/cm2 (312 nm) every other day. Ear samples were prepared from the anesthetized mice. (A and B) One of the ear specimens of each animal was paraffin-embedded and cut with a sliding microtome to 5-μm thickness. Tissue sections were subjected to H & E staining and immunohistochemical examination. (A) UVB-induced epidermal hyperproliferation was analyzed using NIS-element software. Arrows indicate the width of the epidermis. Data show mean ± SD (n = 5). Statistical significance between treatment groups is shown by asterisks as follows: *p < 0.05. Representative images are shown at ×100 magnification, scale bar: 20 μm. (B) Immunohistochemical staining for infiltrated neutrophils with monoclonal antibody against the neutrophil marker, NIMP-R14. The number of infiltrated neutrophils was analyzed using the NIS-element software. Data shown are the mean ± SD (n = 5). *p < 0.05. Magnification, ×400; scale bars = 40 μm. (C) Another ear specimen was soaked in 2 N NaBr solution for exfoliating the epidermis and immersed in 0.14% L-DOPA solution for 3 h at room temperature. The number of melanocytes was analyzed using the NIS-element software. Data show mean ± SD (n = 5). **p < 0.01. Magnification, ×1000; scale bars = 80 μm. Abdel-Rahman, S., Shaban, N., Haggag, A., Awad, D., Bassiouny, A., and Talaat, I. (2015). Inhibition of NF-κB, Bcl-2 and COX-2 gene expression by an extract of eruca sativa seeds during rat mammary gland carcinogenesis. Asian Pac J Cancer Prev. 16, 8411-8418. Bashir, M.M., Sharma, M.R., and Werth, V.P. (2009a). TNF-α production in the skin. Arch Dermatol Res. 301, 87-91. Bashir, M.M., Sharma, M.R., and Werth, V.P. (2009b). UVB and proinflammatory cytokines synergistically activate TNF-α production in keratinocytes through enhanced gene transcription. J Invest Dermatol. 129, 994-1001. Bera, A., Zhao, S., Cao, L., Chiao, P.J., and Freeman, J.W. (2013). Oncogenic K-Ras and loss of Smad4 mediate invasion by activating an EGFR/NF-κB Axis that induces expression of MMP9 and uPA in human pancreas progenitor cells. PLoS One. 8, e82282. Berking, C., Takemoto, R., Satyamoorthy, K., Elenitsas, R., and Herlyn, M. (2001). Basic fibroblast growth factor and ultraviolet B transform melanocytes in human skin. Am J Pathol. 158, 943-953. Bielenberg, D.R., Bucana, C.D., Sanchez, R., Donawho, C.K., Kripke, M.L., and Fidler, I.J. (1998). Molecular regulation of UVB-induced cutaneous angiogenesis. J Invest Dermatol. 111, 864-872. Bond, M., Fabunmi, R.P., Baker, A.H., and Newby, A.C. (1998). Synergistic upregulation of metalloproteinase-9 by growth factors and inflammatory cytokines: an absolute requirement for transcription factor NF-κB. FEBS Lett. 435, 29-34. Borghi, A., Verstrepen, L., and Beyaert, R. (2016). TRAF2 multitasking in TNF receptor-induced signaling to NF-κB, MAP kinases and cell death. Biochem Pharmacol. 116, 1-10. Bos, J.D., and Meinardi, M.M. (2000). The 500 Dalton rule for the skin penetration of chemical compounds and drugs. Exp Dermatol. 9, 165-169. Bosch, R., Philips, N., Suarez-Perez, J.A., Juarranz, A., Devmurari, A., Chalensouk-Khaosaat, J., and Gonzalez, S. (2015). Mechanisms of photoaging and cutaneous photocarcinogenesis, and photoprotective strategies with phytochemicals. Antioxidants. 4, 248-268. Boucher, L.M., Marengere, L.E., Lu, Y., Thukral, S., and Mak, T.W. (1997). Binding sites of cytoplasmic effectors TRAF1, 2, and 3 on CD30 and other members of the TNF receptor superfamily. Biochem Biophys Res Commun. 233, 592-600. Bradley, J.R., and Pober, J.S. (2001). Tumor necrosis factor receptor-associated factors (TRAFs). Oncogene. 20, 6482-6491. Chiu, H.W., Chen, C.H., Chen, Y.J., and Hsu, Y.H. (2017). Farinfrared suppresses skin photoaging in ultraviolet B-exposed fibroblasts and hairless mice. PLoS One. 12, e0174042. Chung, J.Y., Park, Y.C., Ye, H., and Wu, H. (2002). All TRAFs are not created equal: common and distinct molecular mechanisms of TRAF-mediated signal transduction. J Cell Sci. 115, 679-688. Davies, C.C., Mak, T.W., Young, L.S., and Eliopoulos, A.G. (2005). TRAF6 is required for TRAF2-dependent CD40 signal transduction in nonhemopoietic cells. Mol Cell Biol. 25, 9806-9819. Declercq, W., Denecker, G., Fiers, W., and Vandenabeele, P. (1998). Cooperation of both TNF receptors in inducing apoptosis: involvement of the TNF receptor-associated factor binding domain of the TNF receptor 75. J Immunol. 161, 390-399. Escarcega, R.O., Fuentes-Alexandro, S., Garcia-Carrasco, M., Gatica, A., and Zamora, A. (2007). The transcription factor nuclear factor-κB and cancer. Clin Oncol. 19, 154-161. Fagot, D., Asselineau, D., and Bernerd, F. (2002). Direct role of human dermal fibroblasts and indirect participation of epidermal keratinocytes in MMP-1 production after UV-B irradiation. Arch Dermatol Res. 293, 576-583. Faustman, D., and Davis, M. (2010). TNF receptor 2 pathway: drug target for autoimmune diseases. Nat Rev Drug Discov. 9, 482-493. Fisher, G.J. (2005). The pathophysiology of photoaging of the skin. Cutis. 75, 5-8. Grine, L., Dejager, L., Libert, C., and Vandenbroucke, R.E. (2015). Dual inhibition of TNFR1 and IFNAR1 in imiquimod-Induced psoriasiform skin inflammation in mice. J Immunol. 194, 5094-5102. Guan, Y.J., Zhang, Z., Yu, C., Ma, L., Hu, W., Xu, L., Gao, J.S., Chung, C.S., Wang, L., and Yang, Z.F. (2011). Phospho-SXXE/D motif mediated TNF receptor 1-TRADD death domain complex formation for T cell activation and migration. J Immunol. 187, 1289-1297. Han, Y.P., Tuan, T.L., Wu, H., Hughes, M., and Garner, W.L. (2001). TNF-α stimulates activation of pro-MMP2 in human skin through NF-(κ)B mediated induction of MT1-MMP. J Cell Sci. 114, 131-139. Henkler, F., Baumann, B., Fotin-Mleczek, M., Weingartner, M., Schwenzer, R., Peters, N., Graness, A., Wirth, T., Scheurich, P., and Schmid, J.A. (2003). Caspase-mediated cleavage converts the tumor necrosis factor (TNF) receptor-associated factor (TRAF)-1 from a selective modulator of TNF receptor signaling to a general inhibitor of NF-κB activation. J Biol Chem. 278, 29216-29230. Hijdra, D., Vorselaars, A.D., Grutters, J.C., Claessen, A.M., and Rijkers, G.T. (2012). Differential expression of TNFR1 (CD120a) and TNFR2 (CD120b) on subpopulations of human monocytes. J Inflamm. 9, 38. Hirobe, T., Furuya, R., Akiu, S., Ifuku, O., and Fukuda, M. (2002). Keratinocytes control the proliferation and differentiation of cultured epidermal melanocytes from ultraviolet radiation B-induced pigmented spots in the dorsal skin of hairless mice. Pigment Cell Res. 15, 391-399. Kim, H., Lee, S., and Lee, S.W. (2018). TRAF6 distinctly regulates hematopoietic stem and progenitors at different periods of development in mice. Mol Cells. 41, 753-761. Lee, K.J., Lim, D., Yoo, Y.H., Park, E.J., Lee, S.H., Yadav, B.K., Lee, Y.K., Park, J.H., Kim, D., and Park, K.H. (2016). Paired Ig-like type 2 receptor-derived agonist ligands ameliorate inflammatory reactions by downregulating beta1 integrin activity. Mol Cells. 39, 557-565. Naude, P.J., den Boer, J.A., Luiten, P.G., and Eisel, U.L. (2011). Tumor necrosis factor receptor cross-talk. FEBS J. 278, 888-898. O’Dea, E.L., Kearns, J.D., and Hoffmann, A. (2008). UV as an amplifier rather than inducer of NF-κB activity. Mol Cell. 30, 632-641. Pandel, R., Poljsak, B., Godic, A., and Dahmane, R. (2013). Skin photoaging and the role of antioxidants in its prevention. ISRN Dermatol. 2013, 930164. Rijken, F., Kiekens, R.C., van den Worm, E., Lee, P.L., van Weelden, H., and Bruijnzeel, P.L. (2006). Pathophysiology of photoaging of human skin: focus on neutrophils. Photochem Photobiol Sci. 5, 184-189. Rothe, M., Wong, S.C., Henzel, W.J., and Goeddel, D.V. (1994). A novel family of putative signal transducers associated with the cytoplasmic domain of the 75 kDa tumor necrosis factor receptor. Cell. 78, 681-692. Rothe, M., Xiong, J., Shu, H.B., Williamson, K., Goddard, A., and Goeddel, D.V. (1996). 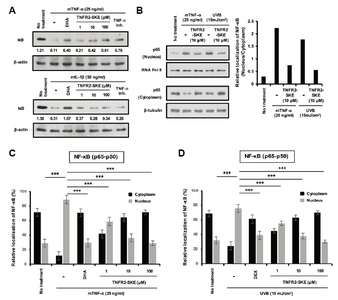 I-TRAF is a novel TRAF-interacting protein that regulates TRAF-mediated signal transduction. Proc Natl Acad Sci USA. 93, 8241-8246. Saliou, C., Kitazawa, M., McLaughlin, L., Yang, J.P., Lodge, J.K., Tetsuka, T., Iwasaki, K., Cillard, J., Okamoto, T., and Packer, L. (1999). Antioxidants modulate acute solar ultraviolet radiation-induced NF-κ-B activation in a human keratinocyte cell line. Free Radic Biol Med. 26, 174-183. Simon, M.M., Aragane, Y., Schwarz, A., Luger, T.A., and Schwarz, T. (1994). UVB light induces nuclear factor κB (NF κB) activity independently from chromosomal DNA damage in cell-free cytosolic extracts. J Invest Dermatol. 102, 422-427. Skov, L., Hansen, H., Allen, M., Villadsen, L., Norval, M., Barker, J.N., Simon, J., and Baadsgaard, O. (1998). Contrasting effects of ultraviolet A1 and ultraviolet B exposure on the induction of tumour necrosis factor-α in human skin. Br J Dermatol. 138, 216-220. Sun, H.B., Malacinski, G.M., and Yokota, H. (2002). Promoter competition assay for analyzing gene regulation in joint tissue engineering. Front Biosci. 7, a169-174. Tanaka, K., Asamitsu, K., Uranishi, H., Iddamalgoda, A., Ito, K., Kojima, H., and Okamoto, T. (2010). Protecting skin photoaging by NF-κB inhibitor. Curr Drug Metab. 11, 431-435. Tanaka, K., Hasegawa, J., Asamitsu, K., and Okamoto, T. (2005). Prevention of the ultraviolet B-mediated skin photoaging by a nuclear factor κB inhibitor, parthenolide. J Pharmacol Exp Ther. 315, 624-630. Varfolomeev, E.E., and Ashkenazi, A. (2004). Tumor necrosis factor: an apoptosis JuNKie?. Cell. 116, 491-497. Xia, J., Song, X., Bi, Z., Chu, W., and Wan, Y. (2005). UV-induced NF-κB activation and expression of IL-6 is attenuated by (−)-epigallocatechin-3-gallate in cultured human keratinocytes in vitro. Int J Mol Med. 16, 943-950. Ye, H., Park, Y.C., Kreishman, M., Kieff, E., and Wu, H. (1999). The structural basis for the recognition of diverse receptor sequences by TRAF2. Mol Cell. 4, 321-330. Zhang, H., Zhang, H., Lin, Y., Li, J., Pober, J.S., and Min, W. (2007). RIP1-mediated AIP1 phosphorylation at a 14–3-3-binding site is critical for tumor necrosis factor-induced ASK1-JNK/p38 activation. J Biol Chem. 282, 14788-14796. Zhou, L., Yan, C., Gieling, R.G., Kida, Y., Garner, W., Li, W., and Han, Y.P. (2009). Tumor necrosis factor-α induced expression of matrix metalloproteinase-9 through p21-activated kinase-1. BMC Immunol. 10, 15.